The CoStar Group (NASDAQ:CSGP) individually recognized five MacKenzie associates as 2015 CoStar Power Brokers; Executive Vice President/Principal Thomas L. Fidler, Jr., Senior Vice President/Principal John Schultz, Vice President Ginny Vernick, Real Estate Advisor Michael Gioioso, and Real Estate Advisor Laura Williams for leasing activity last year. MacKenzie’s brokerage division, which employs more than 30 brokers, was also a recipient of CoStar’s top sales and leasing awards. Now in its fifteenth year, the annual awards distinguish the “best of the best” in commercial real estate by spotlighting brokers who generated the highest transaction volumes in commercial property sales or leases for the year in their respective market. As the largest professional research organization serving the commercial real estate industry, CoStar is uniquely positioned to identify the top firms and brokers in each market throughout the U.S.
Scott Wimbrow, President of MacKenzie Commercial Real Estate Services, LLC, attributes the company’s continued success to its commitment to supporting a professional environment that enables their associates to achieve success while building long-term relationships with clients, partner organizations, and the community as a whole. 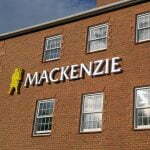 For more information on MacKenzie’s full service platform, please visit www.mackenziecommercial.com.